This combination plays critical roles in building strong bones, protecting heart and brain by maintaining proper balance between its ingredients. While taking vitamin D, body creates more of vitamin K2-dependent proteins, the proteins that will move the calcium around. They have a lot of potential health benefits. But until the K2 comes in to activate those proteins, those benefits aren't realized. Vitamin D and K2 work together to strengthen our bones and teeth and improve our heart health. Vitamin K2 also helps remove calcium from areas where it shouldn't be, such as in your arteries and soft tissues. Moreover, its deficiency is actually what produces the symptoms of vitamin D toxicity, which includes inappropriate calcification that can lead to hardening of your arteries. Additionally, magnesium also helps keep calcium in the cell to do its job far better. As with vitamin D and K2, magnesium deficiency is also common, and when you are lacking in magnesium and take calcium, you may exacerbate the situation. Vitamin K2 and magnesium complement each other, as magnesium helps lower blood pressure, which is an important component of heart disease. Calcium Aspartate Anhydrous in this combination is known for its superior calcium absorption rate (92%) and can increase bone density. While talking about other ingredients, folate benefits cardiovascular health and nervous system function by depleting excess homocysteine. We need methylcobalamin for the healthy development and sustenance of our circulatory, immune and nervous systems. Pyridoxine-5-phosphate plays a fundamental role in amino acid metabolism, heme biosynthesis, neurotransmitter biosynthesis, collagen formation and glucocorticoid action. It also regulates the electrical functioning of nerves, heart and musculoskeletal system. Zinc is known to play an important role in the bone remodeling cycle and is also essential for many bodily functions including the immune response, reproduction, growth and development, and neurological roles. 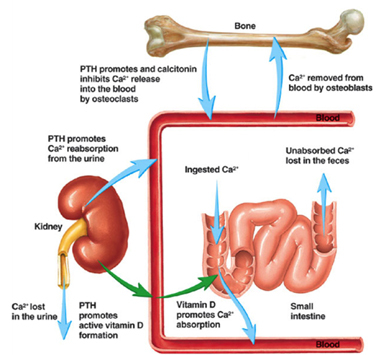 Calcitriol is a form of vitamin D that is used to treat and prevent low levels of calcium in the blood of patients whose kidneys or parathyroid glands (glands in the neck that release natural substances to control the amount of calcium in the blood) are not working normally. Low blood levels of calcium may cause bone disease. Calcitriol is in a class of vitamins. It works by helping the body to use more of the calcium found in foods or supplements. Calcitriol is also sometimes used to treat rickets (softening and weakening of bones in children caused by lack of vitamin D), osteomalacia (softening and weakening of bones in adults caused by lack of vitamin D), and familial hypophosphatemia (rickets or osteomalacia caused by decreased ability to break down vitamin D in the body). It is also sometimes used to increase the amount of calcium in the blood of premature (born early) babies. Vitamin K2 (the menaquinones) is a group name for a family of related compounds, generally subdivided into short-chain menaquinones (with MK-4 as the most important member) and the long-chain menaquinones, of which MK-7, MK-8 and MK-9 are nutritionally the most recognized. 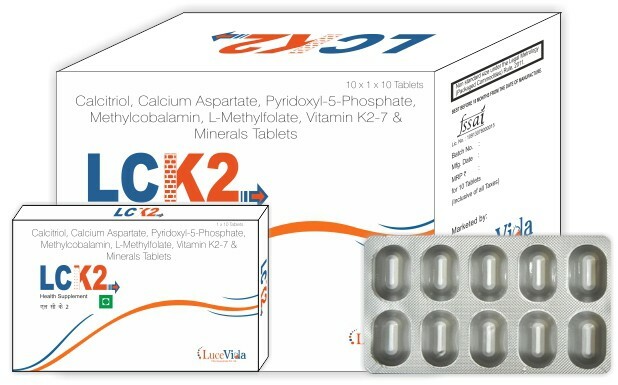 Vitamin K2-7 supports healthy bone matrix and bone strength, supports cardiovascular health, alleviates muscle cramps and supports muscle function. It also enhances oxygen utilization, supports cardio fitness and leads to more energy. It is the primary biologically active form of folic acid used at the cellular level for DNA reproduction, the cysteine cycle and the regulation of homocysteine. It is also the form found in circulation and transported across membranes into tissues and across the blood-brain barrier. In the cell, L-methylfolate is used in the methylation of homocysteine to form methionine and tetrahydrofolate (THF). THF is the immediate acceptor of one carbon units for the synthesis of thymidine-DNA, purines (RNA and DNA) and methionine. Folate is needed in the human body for production of red blood cells. Folate deficiency can lead to decreased red blood cells, or anemia. It is involved in neurotransmitter synthesis and critical enzymatic reactions throughout the body. By depleting excess homocysteine, folate benefits cardiovascular health and nervous system function. Methylcobalamin is the most potent form of Vitamin B 12 found in nature. We need methylcobalamin for the healthy development and sustenance of our circulatory, immune and nervous systems. Vitamin B 12 is normally involved in several metabolisms such as DNA synthesis and regulation, fatty acid synthesis, and energy production. It has been used to treat some nutritional diseases and other diseases in clinic, such as Alzheimer's disease and rheumatoid arthritis. Vitamin B12 is regarded as painkilling vitamin in some countries from 1950. It has superior calcium absorption rate (92%) and can increase bone density. It is used in patients with osteoarthritis or arthritis by gaining back significant volume in the knee cartilage and by reducing the size of their cartilage lesions. Pyridoxal-phosphate, otherwise known as PLP, is the active or coenzyme form of vitamin B6. PLP contains three natural organic compounds -- pyridoxal, pyridoxamine and pyridoxine. In body, PLP plays a fundamental role in amino acid metabolism, heme biosynthesis, neurotransmitter biosynthesis, collagen formation and glucocorticoid action. Additionally, it helps to balance sodium and potassium levels by regulating the electrical functioning of nerves, heart and musculoskeletal system. Alone and together with other enzymes, PLP helps body to build and break down amino acids and to change amino acids from one to another. Further, it facilitates the release of stored energy from liver and muscles and facilitates the production of antibodies and red blood cells. PLP has the capacity to lower body's levels of homocysteine, which is obtained from another amino acid called "methionine." Homocysteine is a potential risk factor for cardiovascular disease, and PLP can reduce methionine levels in body, resulting in lower production of homocysteine. Additionally, it can help protect the body from coronary heart disease, hypertension and cerebral vascular disease. Magnesium assures the strength and firmness of bones and makes teeth harder. It is essential for absorption and metabolism of calcium. Magnesium also has a role to play, together with the thyroid and parathyroid glands, in supporting bone health: stimulating the thyroid's production of calcitonin, which acts as a bone-preserving hormone, and regulating parathyroid hormone, a function of which is to regulate bone breakdown in a number of ways. The enzyme that is required for forming new calcium crystals, alkaline phosphatase, also requires magnesium for activation, and if levels are low, abnormal bone crystal formation can result. Even mild magnesium deficiency is reported to be a leading risk factor for osteoporosis. Absorption: Among the various forms of menaquinones, the length of the side chain plays an additional role in bioavailability, as menaquinones with medium-length side chains (e.g., MK-7) are better absorbed compared to those with short (MK-4) or long (e.g., MK-8 and MK-9) side chains.Vitamin K2-7 appears to be absorbed rapidly and unchanged from the gastrointestinal tract. As with other lipid-soluble compounds, optimal absorption is dependent on the presence of bile acids. Distribution: It is carried in the lymph in mixed micelles composed of bile salts, and subsequently released into the circulation. Metabolism: The liver is the principal site of Vitamin K metabolism, involving oxidative degradation of the side-chain. Excretion: Metabolites are subsequently eliminated via the bile or urine. Absorption: Peak plasma levels have been reported 1 to 3 hours following administration. The mean values for Cmax and Tmax were 129 ng/ml and 1.3 hr, respectively. Distribution: The plasma protein binding of L-methylfolate is 56%. Metabolism: The mean elimination half-life is approximately 3 hours. Excretion: L-methylfolate is primarily excreted via the kidneys. Absorption: Peak plasma concentrations after 3 hr. It is readily absorbed in distal half of the ileum. Distribution: Protein binding is very high to specific transcobalamins plasma proteins. Metabolism: Hepatic Biological half-life Approximately 6 days (400 days in the liver). Absorption: Absorbed by passive diffusion in the jejunum and to a lesser extent in the ileum. Distribution: Primarily stored in the liver, lesser amount in the muscle and brain. Not protein bound. Metabolism: Metabolized in the liver. Excretion: Excreted in the urine. The t ½ is 15 to 20 days.